In February 2017 I visited Central Africa, in particular Uganda and Cameroon. The trip through Cameroon was organized by Exploring Tourism Cameroon. The itinerary involved a lot of driving. As it turned out, much of the driving was on terrible dirt roads, in total about 1,000 km (600 miles) on dirt roads. My documents from the tour company indicated we would have a 4x4. As it turned out, I ended up in a decrepit Toyota Corolla, without working seat belts. There big arguments between the car driver and the tour organizer (who rented the car). Apparently, the tour company had expected a better car. On the roads there are police checkpoints everywhere, some of them go as far as checking the luggage, and checking my visa. Altogether they were not friendly towards tourists, some made me feel uncomfortable. On the first day, we were scheduled to drive from Douala to Yaoundé. 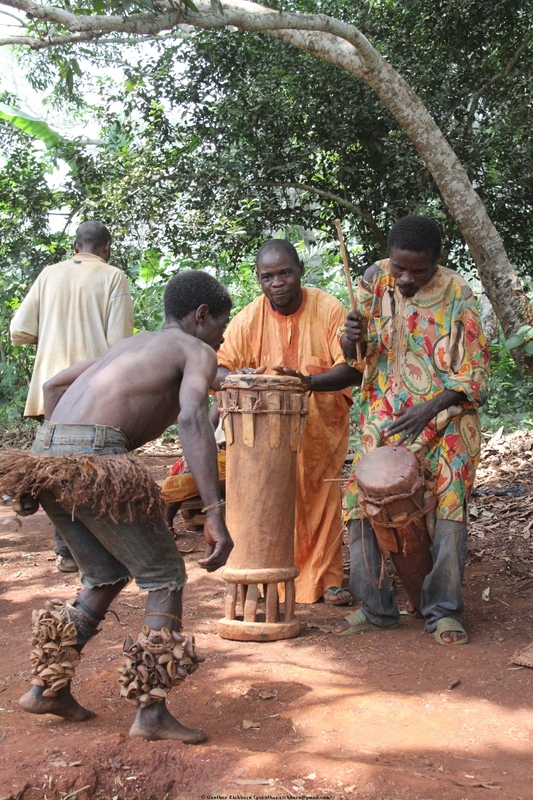 However, my guide continued past Yaoundé to Ayos. Apparently, there were no hotel reservations throughout the trip in advance, so my guide changed the itinerary several times. On the first day of driving we were stopped for speeding. The hotel in Ayos was primitive, no running water, just a couple of buckets with water. It was an indication of how things in Cameroon work. The next day we again drove further than scheduled in the itinerary and ended the day in Batouri. On the way, from the town Abong Mbang, we made an excursion to the village of a Pygmy tribe near Ntimbé. The hotel in Batouri again had no running water. Electricity was also not available for quite some time. This meant warm beer in Batouri. All the bars and restaurants were playing loud music, and as everywhere, people were not friendly. From Batouri is was all dirt roads, which were mostly in terrible shape. The next stop after Batouri was Yokadouma, finally according to the itinerary. The hotel in Yokadouma was the first with running water, however, only cold water in the shower. The next stop was at the Lobéké National Park. According to the itinerary I was supposed to spend the night in a tent at the park headquarters. The next morning I was supposed to hike into the park and spend two nights in a tent. I would have the day watching wildlife. The next day was also supposed to be spent watching wildlife. On the third day I was supposed to hike back and spend another night at the headquarters. My guide changed that, and had us hiking into the park after arrival at park headquarters in the late afternoon. Because of this change, I didn't have that day for wildlife watching, I had only one day. Also, because he dropped the night at park headquarters, we were one day ahead of the itinerary. I ended up spending two days in Douala at the end of the trip. After two nights in the park in a tent, I spent the next night in a tent at park headquarters. The next day was the hardest day of driving on the trip. We drove 12 ½ hours on bad dirt roads back to Batouri. In Batouri I spent another night in a hotel without running water. The next day we visited a gold mining operation in Batouri. It is entirely manual labor, washing sand to extract the gold. After that visit we drove to Bertoua. The hotel in Bertoua was the best of the trip, it even had warm water in the shower. The next day was spent driving to Yaoundé. On the way we stopped at a German fort from before WW I. The hotel in Yaoundé did have running water, but only cold water. The last day driving was from Yaoundé to Douala. On this day, during a police stop, I had to pay 25,000 francs ($45) because of the the seat belt not working. Because of the change in itinerary I had to spend two nights in Douala. My guide didn't have much to do in Douala. I visited a souvenir market and a school teaching handicrafts. Most of the time I spent in the hotel room. It was very hot and very humid, so walking around was very uncomfortable. I went to the airport 13 hours before flight, hoping to have air conditioning in the airport. Unfortunately, that was not the case, so I spent many uncomfortable, sweating hours at the airport. Cameroon is 80% French speaking, and 20% English speaking. From what I can gather, the English speaking part of Cameroon is not happy about their situation, then government is dominated by French speaking people and disadvantages the English speaking part. Cameroon used to be a German colony till the end of WW I. After World War I, the territory was divided between France and the United Kingdom as League of Nations mandates. In 1960, the French-administered part of Cameroon became independent as the Republic of Cameroun under President Ahmadou Ahidjo. The southern part of British Cameroons federated with it in 1961 to form the Federal Republic of Cameroon. The federation was abandoned in 1972. The country was renamed the United Republic of Cameroon in 1972 and the Republic of Cameroon in 1984. Cameroon is ruled by the authoritarian president since 1982, Paul Biya, and his Cameroon People's Democratic Movement party. There is not much democracy in the system at this time. Everywhere in Cameroun the air was very hazy. It was generally hot and very humid. Douala was the worst in that respect. There are lots of motorcycles on the roads. Many of these are used as taxis. My guide and driver frequently used these motorcycle taxis to show us the way, for instance to find the best way around Yaoundé on the way to Ayos on the first day, and later to find specific hotels. In Bertoua I was on one of the motorcycle taxis to get to the gold mine. There is a lot of garbage on the streets in the towns and cities. Driving was pretty chaotic everywhere, especially in the cities. The big trucks drive like maniacs, I saw several overturned trucks. A large part of our trip was on dirt roads. They were some of the worst roads that I have ever been on. We drove about 1,000 km (600 miles) on those roads. 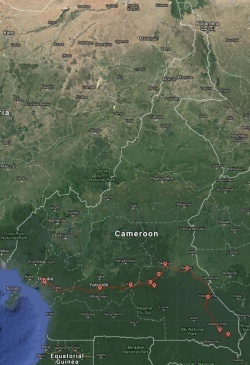 From what I have seen, Cameroon doesn't protect the forests very well. There is an endless stream of big logging trucks with huge logs from trees that must be hundreds of years old by their size. One big truck holds only 3-6 of these big logs. I can't imagine that such an enormous logging operation is sustainable. Beer was reasonably priced at $2.00 for a 0.65 l (0.69 quarts) bottle. However, in many places there was only warm beer. In one bar, the bartender went to a place next door to get cold beer, which I appreciated. Food was very basic. I ended up eating spaghetti with fried eggs, sometimes with tomatoes and peppers, occasionally with some fish. During the last couple of days in Douala I asked my guide to find some more western style restaurants. They were OK.
Cameroon is not at all set up for mainstream tourism. If you want to visit Cameroon, you need to be ready for roughing it. Hotels are primitive in most places. There are no western style restaurants outside of Douala and Yaoundé, you have to be ready to eat very simple African food. What made things even more uncomfortable was the fact that people in Cameroon are not very friendly. I didn't really have any contact with regular people. They also got very upset when I tried to take pictures. On the first evening I took a picture of the restaurant where I was eating. Several people got extremely upset, I was getting afraid they might start beating me up. It was extremely uncomfortable. Because of that I didn't take many pictures. The Lobéké National Park is supposed to have elephants, chimpanzees, and gorillas. Unfortunately, I didn't see any of these. All I saw was a couple of bush bucks and a couple of black and white Colobus monkeys. It was a disappointing visit.